In the image, there are 450 X-ray points of light, 10 of which are expected X-ray binaries. The Whilpool galaxy is supposed to have so many X-ray binaries as it’s in the course of colliding with a smaller adjoining galaxy. This interface causes waves of star creation, producing new stars at a rate seven times quicker than the Milky Way and supernova deaths at a rate 10-100 times faster. The more-massive stars basically race through their evolution in a few million years and then breakdown to form neutron stars or black holes rapidly. 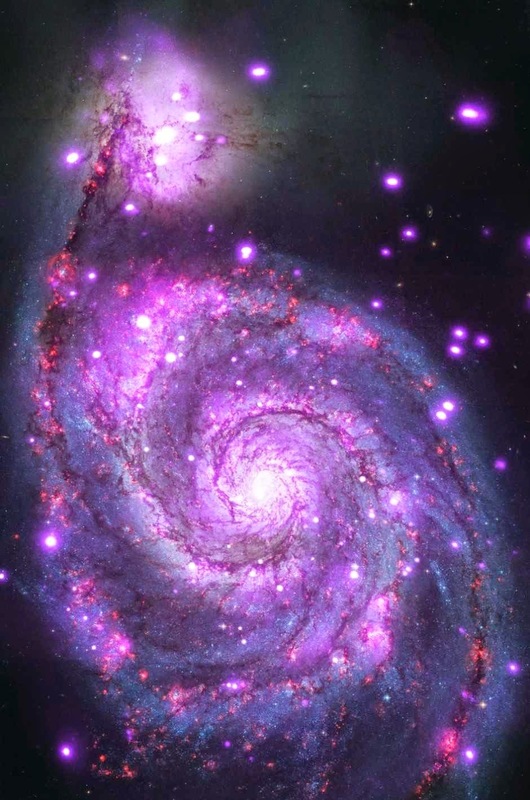 Kilgard said “In this image, there’s a very strong correlation between the fuzzy purple stuff, which is hot gas in the X-ray, and the fuzzy red stuff, which is hydrogen gas in the optical. Both of these are tracing the star formation very actively. You can see it really enhanced in the northern arm that approaches the companion galaxy.” Eight of the 10 X-ray binaries are sited near to star forming areas. Chandra is providing astrophysicists with a detailed look at a class of things that has only one example in the Milky Way. For information visit Chandra website.